Mr. Brown is 71 years old, dying of cancer, with only a few weeks to live. He has no Living Will and has never said he would like to die instead of receiving extraordinary measures. 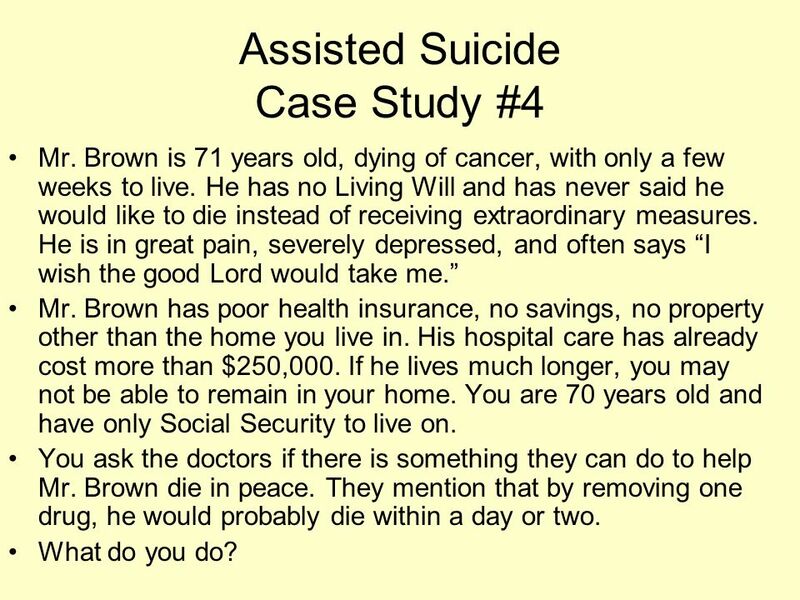 He is in great pain, severely depressed, and often says “I wish the good Lord would take me.” Mr. Brown has poor health insurance, no savings, no property other than the home you live in. His hospital care has already cost more than $250,000. If he lives much longer, you may not be able to remain in your home. You are 70 years old and have only Social Security to live on. You ask the doctors if there is something they can do to help Mr. Brown die in peace. They mention that by removing one drug, he would probably die within a day or two. What do you do? 3 Case Study #5 Your best friend, age 56, has been severely depressed for years, and has attempted suicide at least four times. Each time, your friend was put on anti-depressant drugs and kept under observation. Each time, the depression returned. Your friend has no quality of life: remaining in bed all day long, refusing to talk to anyone, drinking to excess when alone. 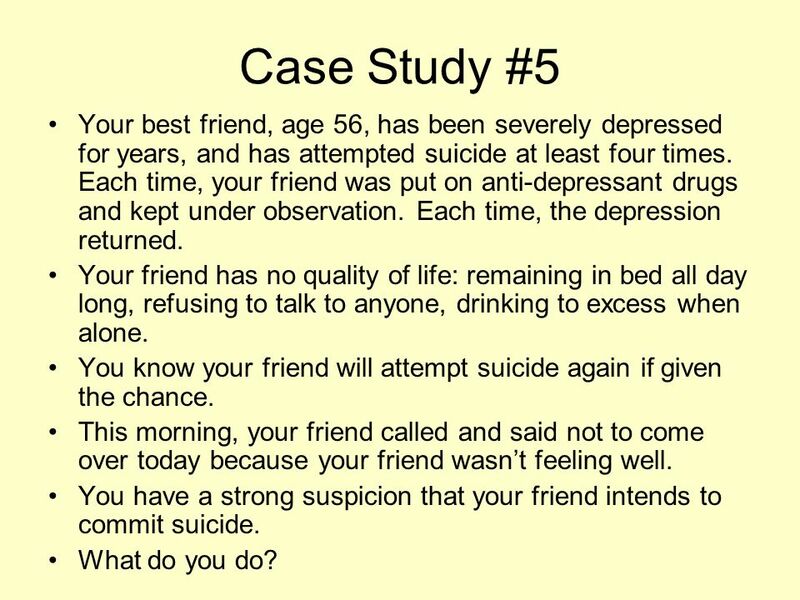 You know your friend will attempt suicide again if given the chance. This morning, your friend called and said not to come over today because your friend wasn’t feeling well. You have a strong suspicion that your friend intends to commit suicide. What do you do? 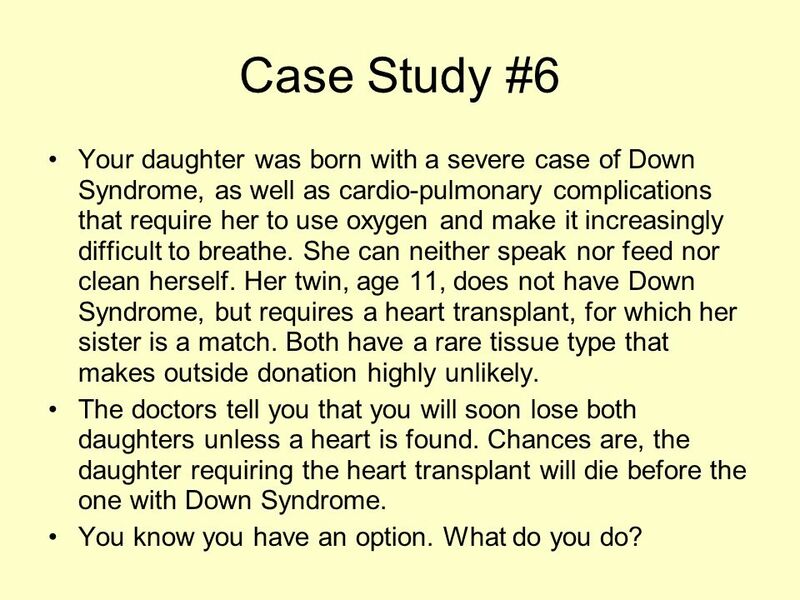 4 Case Study #6 Your daughter was born with a severe case of Down Syndrome, as well as cardio-pulmonary complications that require her to use oxygen and make it increasingly difficult to breathe. She can neither speak nor feed nor clean herself. Her twin, age 11, does not have Down Syndrome, but requires a heart transplant, for which her sister is a match. Both have a rare tissue type that makes outside donation highly unlikely. The doctors tell you that you will soon lose both daughters unless a heart is found. Chances are, the daughter requiring the heart transplant will die before the one with Down Syndrome. You know you have an option. What do you do? 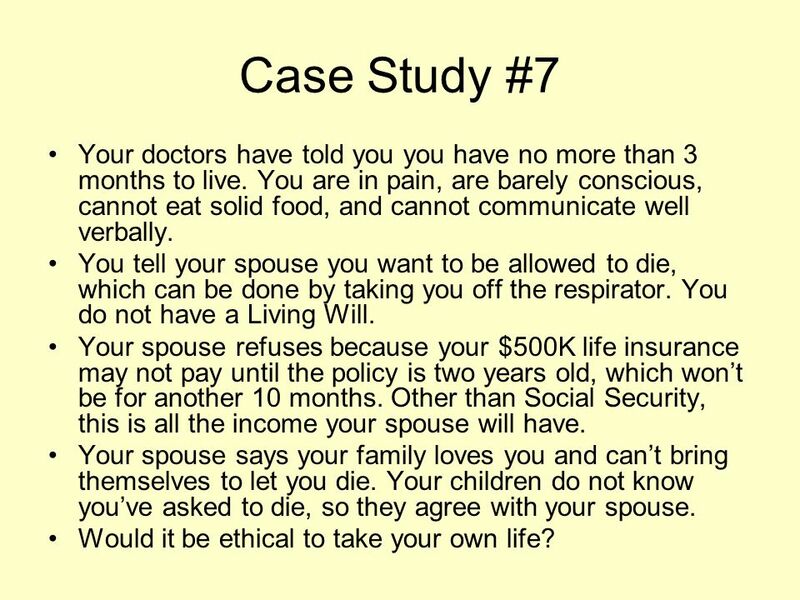 5 Case Study #7 Your doctors have told you you have no more than 3 months to live. You are in pain, are barely conscious, cannot eat solid food, and cannot communicate well verbally. You tell your spouse you want to be allowed to die, which can be done by taking you off the respirator. You do not have a Living Will. Your spouse refuses because your $500K life insurance may not pay until the policy is two years old, which won’t be for another 10 months. Other than Social Security, this is all the income your spouse will have. Your spouse says your family loves you and can’t bring themselves to let you die. Your children do not know you’ve asked to die, so they agree with your spouse. Would it be ethical to take your own life? 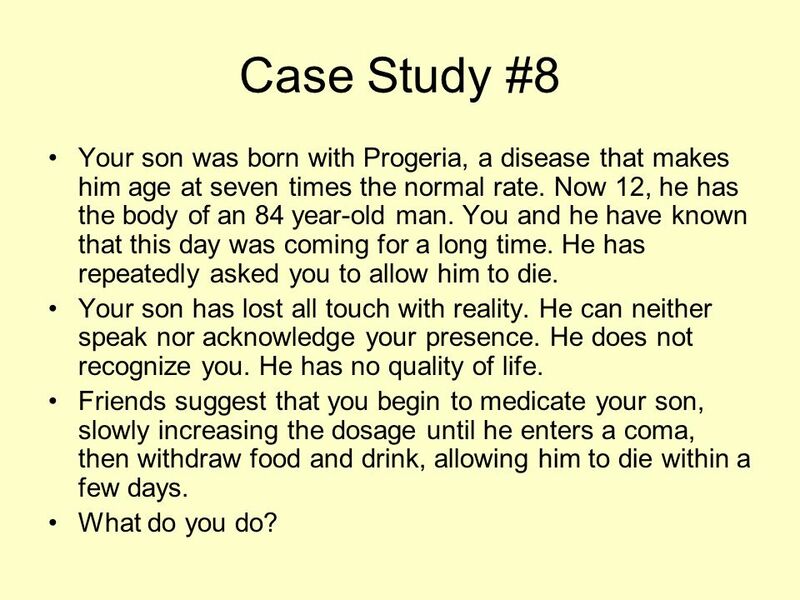 6 Case Study #8 Your son was born with Progeria, a disease that makes him age at seven times the normal rate. Now 12, he has the body of an 84 year-old man. You and he have known that this day was coming for a long time. He has repeatedly asked you to allow him to die. Your son has lost all touch with reality. He can neither speak nor acknowledge your presence. He does not recognize you. He has no quality of life. Friends suggest that you begin to medicate your son, slowly increasing the dosage until he enters a coma, then withdraw food and drink, allowing him to die within a few days. What do you do? 7 Genetic Modification Genetic engineering, also called genetic modification, is the direct human manipulation of an organism's genome using modern DNA technology. It involves the introduction of foreign DNA or synthetic genes into the organism of interest. 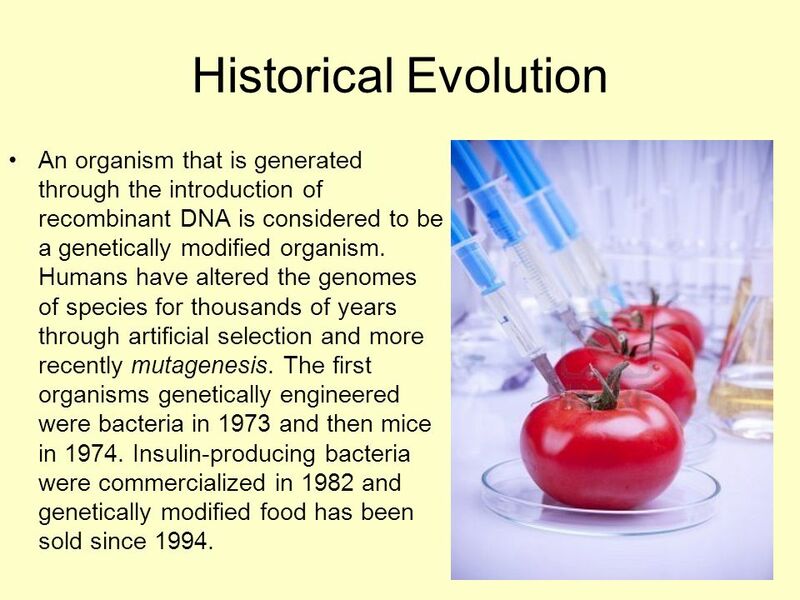 8 Historical Evolution An organism that is generated through the introduction of recombinant DNA is considered to be a genetically modified organism. Humans have altered the genomes of species for thousands of years through artificial selection and more recently mutagenesis. The first organisms genetically engineered were bacteria in 1973 and then mice in Insulin-producing bacteria were commercialized in 1982 and genetically modified food has been sold since 1994. The most common form of genetic engineering involves the insertion of new genetic material at an unspecified location in the host genome. 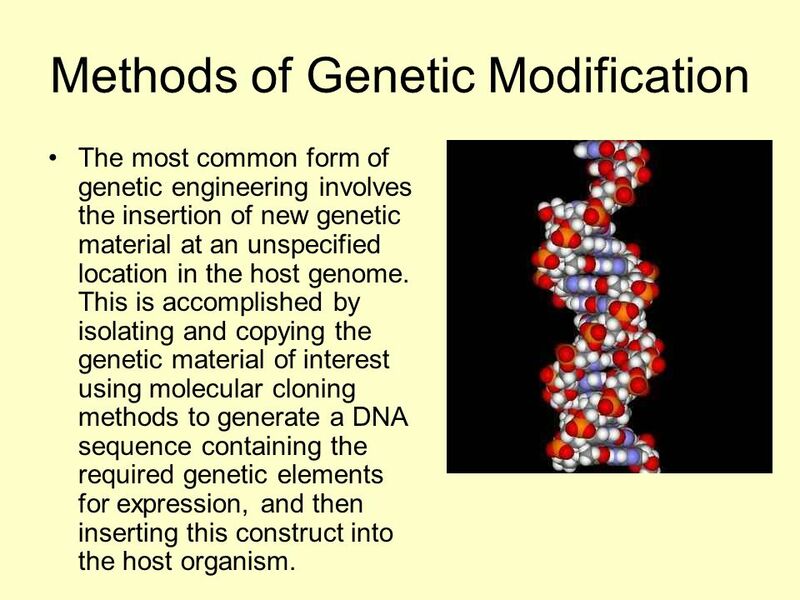 This is accomplished by isolating and copying the genetic material of interest using molecular cloning methods to generate a DNA sequence containing the required genetic elements for expression, and then inserting this construct into the host organism. 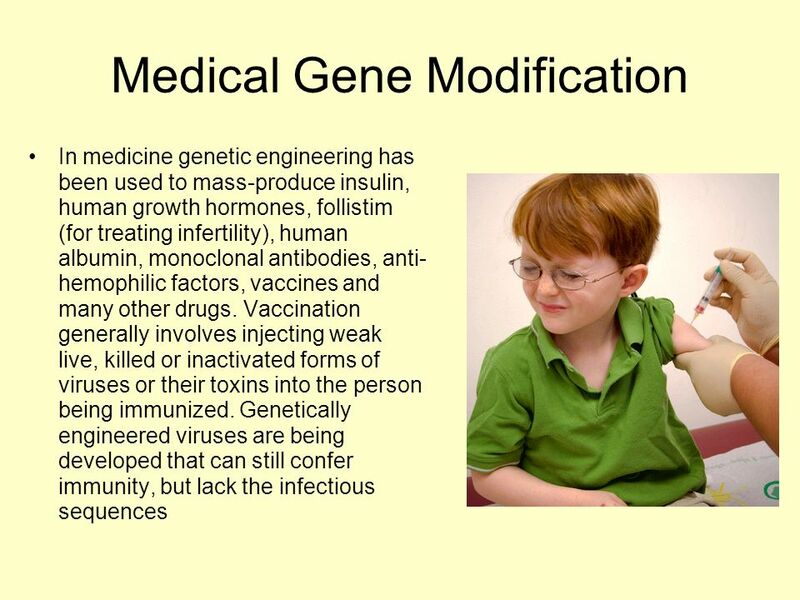 Genetic engineering is used to create animal models of human diseases. Genetically modified mice are the most common genetically engineered animal model. They have been used to study and model cancer (the oncomouse), obesity, heart disease, diabetes, arthritis, substance abuse, anxiety, aging and Parkinson disease. Potential cures can be tested against these mouse models. Also genetically modified pigs have been bred with the aim of increasing the success of pig to human organ transplantation. 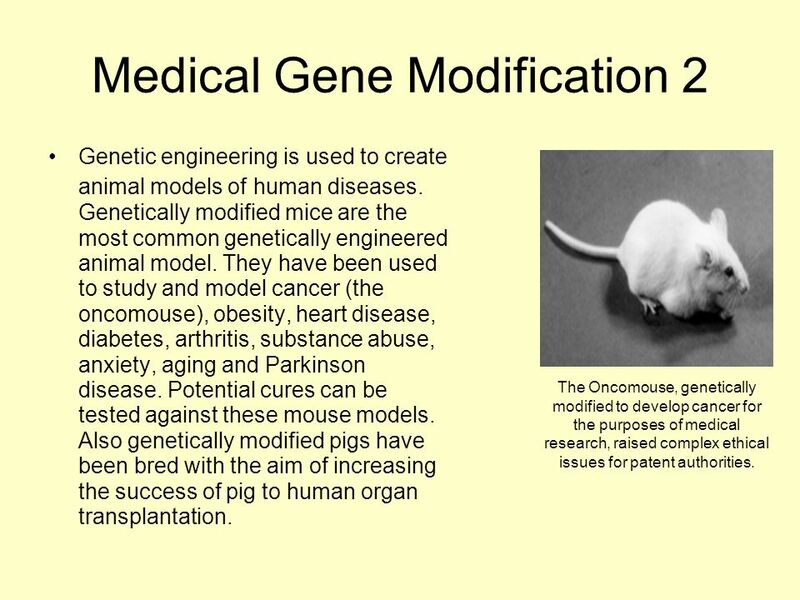 The Oncomouse, genetically modified to develop cancer for the purposes of medical research, raised complex ethical issues for patent authorities. 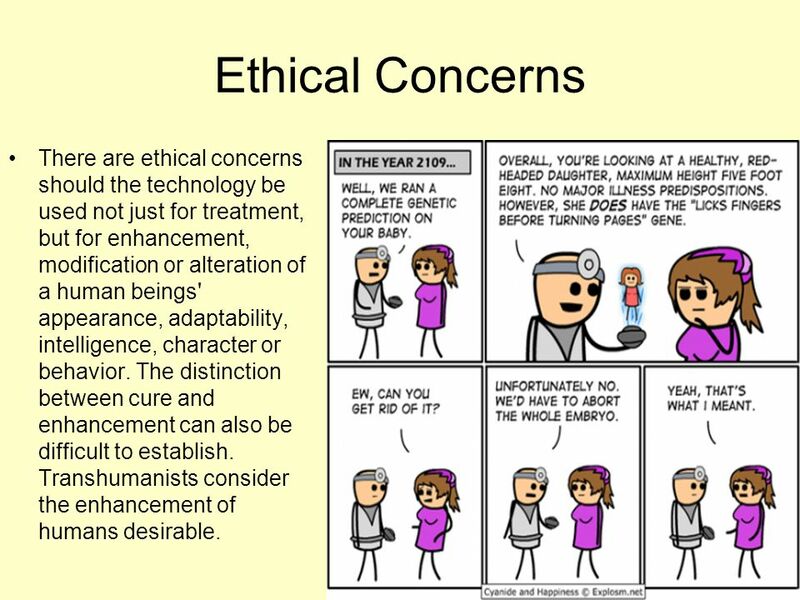 12 Ethical Concerns There are ethical concerns should the technology be used not just for treatment, but for enhancement, modification or alteration of a human beings' appearance, adaptability, intelligence, character or behavior. The distinction between cure and enhancement can also be difficult to establish. Transhumanists consider the enhancement of humans desirable. The potential to genetically engineer humans has raised many ethical issues, ranging from a belief that every fetus has an inherent right to remain genetically unmodified to a belief that parents hold the rights to change their unborn children. In the middle is the belief that every child has the right to be born free from preventable diseases. Molecular Biologist Lee M. Silver believes the use of gene therapy to design children will be spread through what he calls “free market eugenics”. Wealthy families will opt to design their child with genetic advantages because other families are doing so, and everybody wants to provide their newborn child with the best opportunities in life. 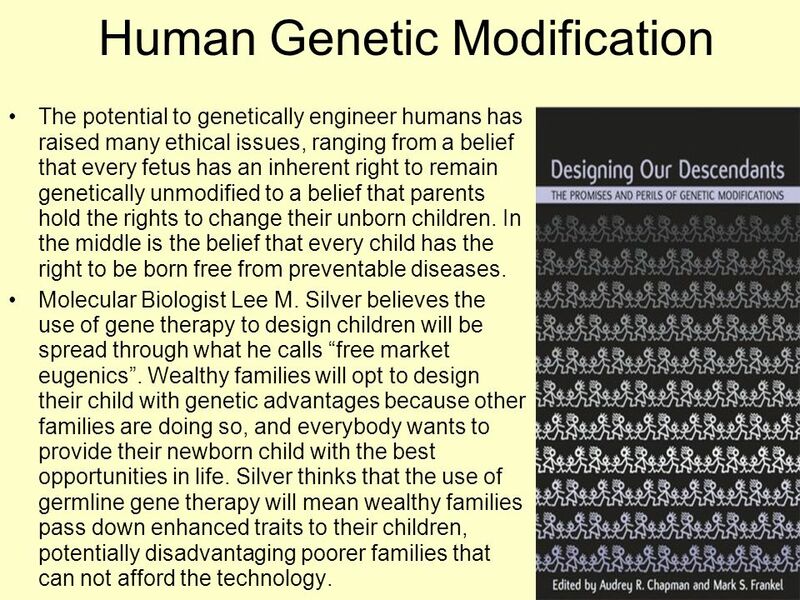 Silver thinks that the use of germline gene therapy will mean wealthy families pass down enhanced traits to their children, potentially disadvantaging poorer families that can not afford the technology. 14 Transhumanists Transhumanism is an international intellectual and cultural movement that affirms the possibility and desirability of fundamentally transforming the human condition by developing and making widely available technologies to eliminate aging and to greatly enhance human intellectual, physical, and psychological capacities. 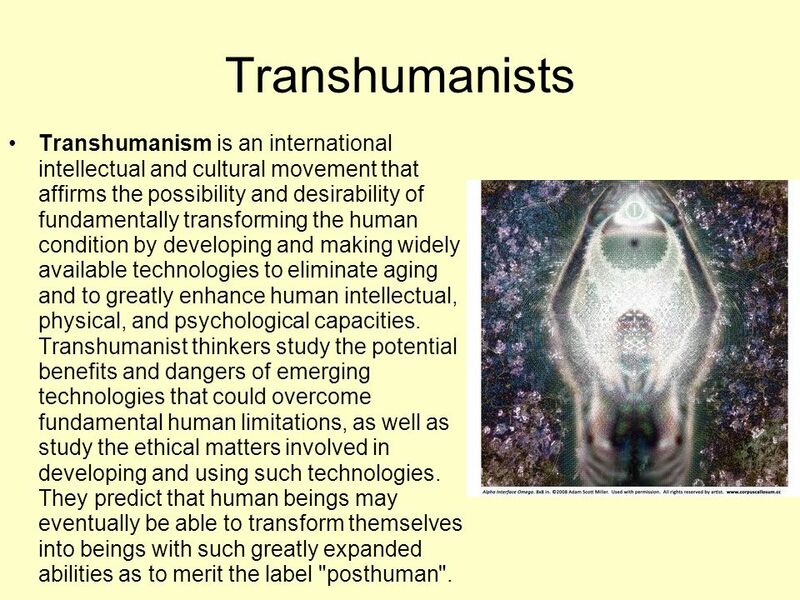 Transhumanist thinkers study the potential benefits and dangers of emerging technologies that could overcome fundamental human limitations, as well as study the ethical matters involved in developing and using such technologies. They predict that human beings may eventually be able to transform themselves into beings with such greatly expanded abilities as to merit the label "posthuman". 15 Case Study #1 Rosemarie and Ali are parents of one child, Jessica, who is “normal” in every way. They are expecting a second child, to whom they intend to give the name Amanda. Prenatal testing reveals that Amanda has Down Syndrome, accompanied by severe cardio-pulmonary disorders. (A 2002 survey revealed that in 95% of cases, the diagnosis of Down Syndrome resulted in the fetus being aborted.) 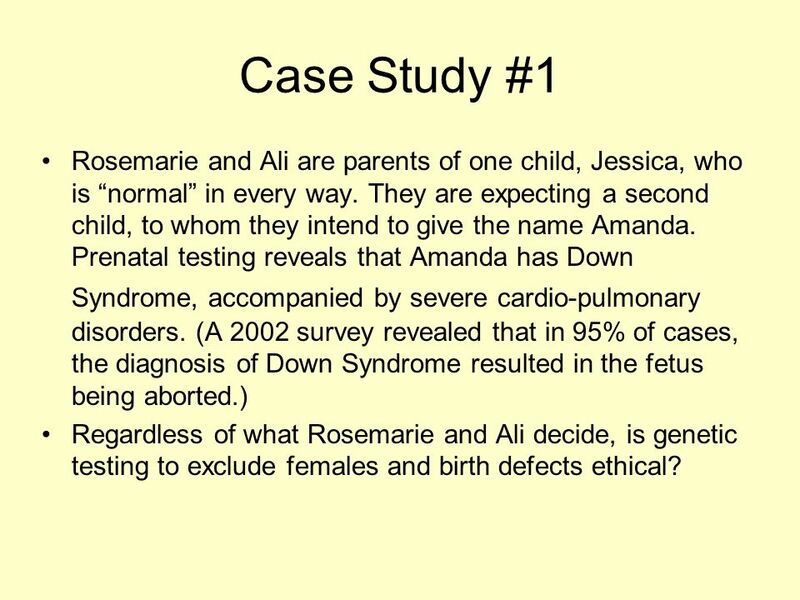 Regardless of what Rosemarie and Ali decide, is genetic testing to exclude females and birth defects ethical? 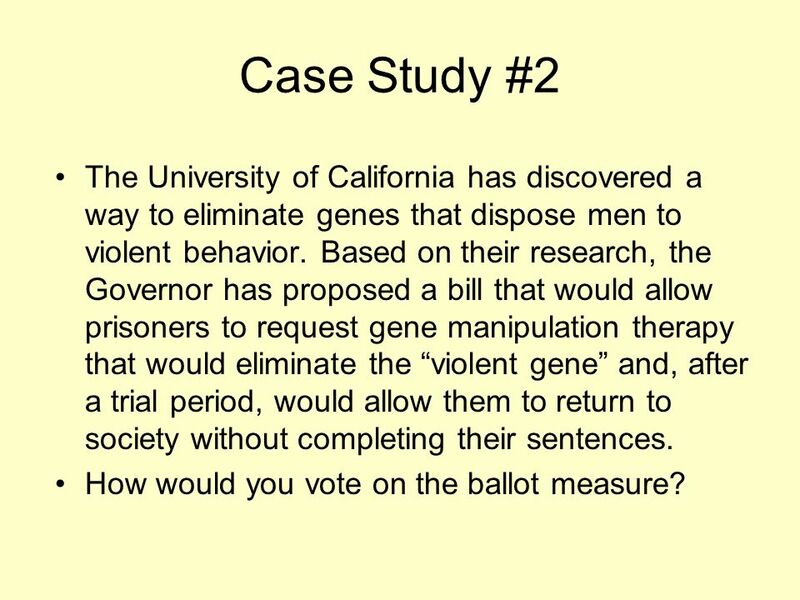 16 Case Study #2 The University of California has discovered a way to eliminate genes that dispose men to violent behavior. Based on their research, the Governor has proposed a bill that would allow prisoners to request gene manipulation therapy that would eliminate the “violent gene” and, after a trial period, would allow them to return to society without completing their sentences. How would you vote on the ballot measure? 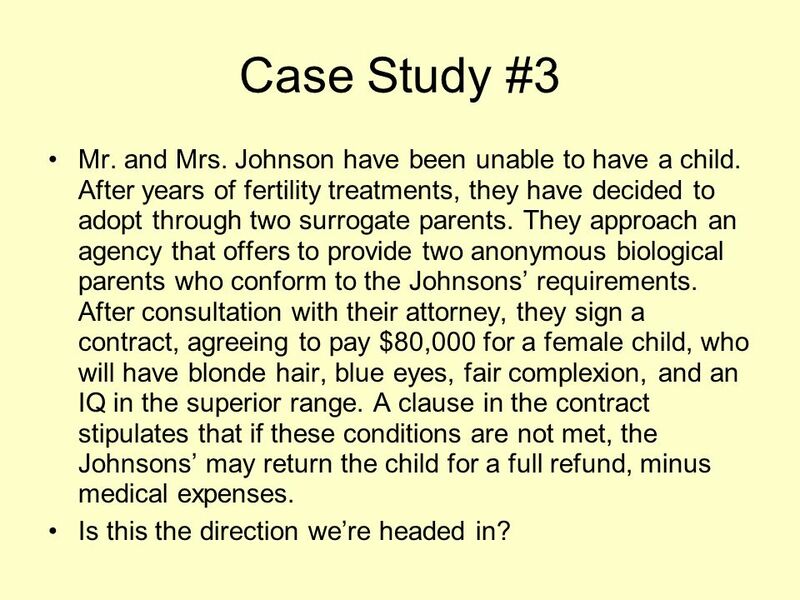 17 Case Study #3 Mr. and Mrs. Johnson have been unable to have a child. After years of fertility treatments, they have decided to adopt through two surrogate parents. They approach an agency that offers to provide two anonymous biological parents who conform to the Johnsons’ requirements. After consultation with their attorney, they sign a contract, agreeing to pay $80,000 for a female child, who will have blonde hair, blue eyes, fair complexion, and an IQ in the superior range. A clause in the contract stipulates that if these conditions are not met, the Johnsons’ may return the child for a full refund, minus medical expenses. Is this the direction we’re headed in? 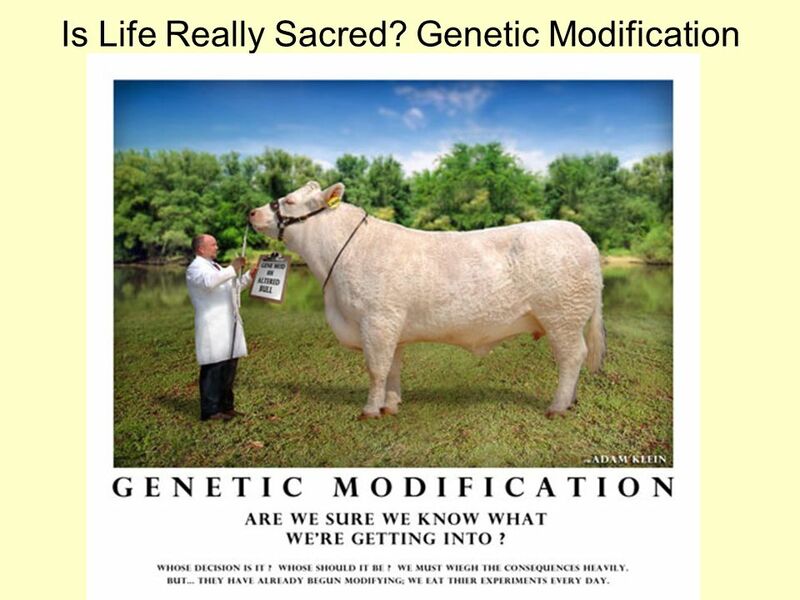 Download ppt "Is Life Really Sacred? Genetic Modification"
1 Preventing Youth Suicide Creating Emotional Safety for our Students School District of Volusia. B1.6 Variation Inheritance Cloning plants Types of reproduction Genetic and environmental differences Genetic engineering Cloning animals. 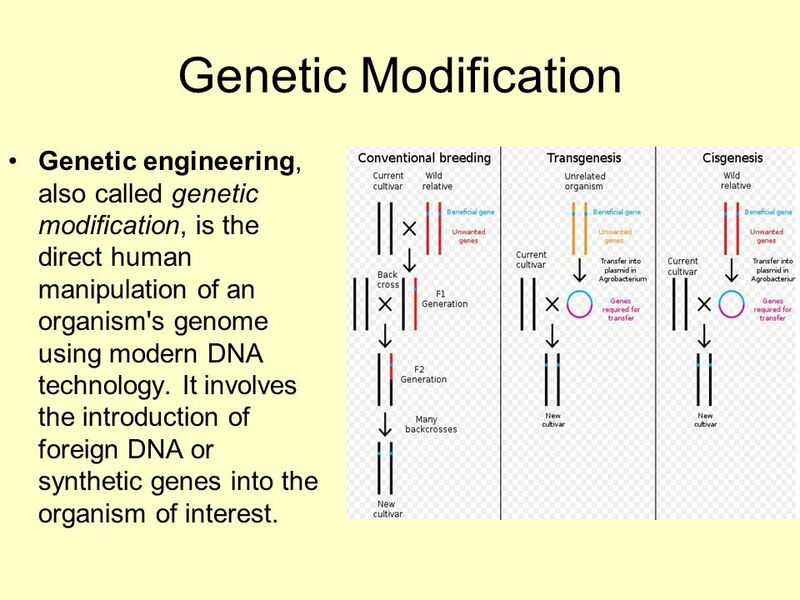 Human Technology Genetically Modified Organisms, Artificial Selection, Selective breeding, Animal husbandry, Gene therapy. End of Life Issues Eshiet I.. Breaking Bioethics By Lara Canham And Danny Nolan. What does it mean to be ProLIFE ? To be in favor of the full protection of ALL human life despite it age, place of residence, stage of development, physical. Prenatal Development The Developing Baby. When you can’t manage your own affairs The Protection of Personal and Property Rights Act 1988. Applied Ethics Ethical Issues Section 2 Computer Science. Genetic Engineering. Tools for Manipulating & Studying DNA  Restriction enzymes  Used to cut DNA where needed  PCR  Used to make multiple copies of. 5.2.3 Gene Therapy explain the term gene therapy; explain the differences between somatic cell gene therapy and germ line cell gene therapy; discuss the. Genetic Engineering Genetic Engineers can alter the DNA code of living organisms. Selective Breeding Recombinant DNA Transgenic Organisms Cloning Selective. ADVANCE HEALTH CARE DIRECTIVES Margie Dino RN Community Health Resource Center. Gene Technologies Chapter 13. Changing Genes? Some gene technologies involve changing the genes of an individual. We’re going to look at some of the science. Meet The Parents. Jack and Jill went up a hill…. Jack and Jill got married. The Human Genome Project (HGP) and drug development.